President: Dr. Guillermo P. Torres, Jr. The University of Mindanao (UM), then the Mindanao Colleges (MC), was opened in Davao City to the public in July 1946. It was the first school to offer tertiary education in Southern Mindanao primarily to provide learning opportunities to the indigenous natives and pioneers of Mindanao. It is hoped that their children shall attain college education which was then a luxury only few elite families could afford. It was a dream come true for CPA-Lawyer Guillermo E. Torres, Sr., and his friends, Engr. Brigodo Valencia, Atty. Pedro Quitain, Atty. Dominador Zuno, Mr. Pedro Lat, Atty. Jesus Occena, Dr. Manuel Babao, Mr. Nacasio Torres and Dra. Concepcion de Asis. During its first year of operation, there were only 13 teachers with only 381 students and four (4) rented rooms of Borgaily Building used as classrooms. The programs which originally operated with permit were: Six (6) years complete Elementary Education, Two (2) years Secondary Education (1st and 2nd years), Two (2) years Elementary Teachers Certificate, Two (2) years Associate in Commercial Sciences, and Two (2) years Associate in Arts. The first commencement exercises was held on April 23, 1948 with 30 and 50 graduating students from college and high school, respectively. The community witnessed the expansion of Mindanao Colleges from 1949 to 1962. Branches were established to give more educational opportunities to many financially deprived students in the neighboring provinces of Davao City. These are MC Digos and MC Sta. Ana in 1949; MC Penaplata and MC Tagum in 1950; MC Guianga, MC Tibungco and MC Panabo in 1951; MC Cotabato in 1959 and MC Bansalan in 1962. Enrolment increased right at the main campus at Bolton Street in the heart of Davao City, which remains to be a fitting symbol of the courage and tenacity of purpose of Atty. Guillermo E. Torres Sr., the founder and the first President of MC. On December 21, 1966, MC was chartered as the University of Mindanao, Inc. the first private, non-sectarian university in Mindanao. The University Charter was signed by the Honorable Pedro Parcasio, then Acting Secretary of Education. The University status brought on new and greater responsibilities and a new image which left no space for complacency but only one decision – no turning back. 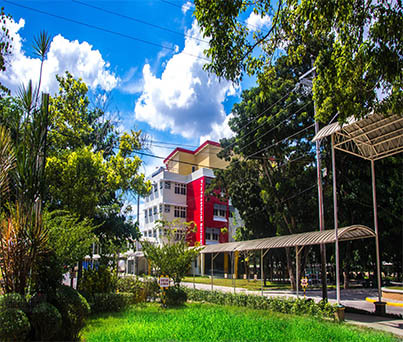 Today, UM in Davao City has three (3) campuses – the Main Campus along Bolton and Bonifacio Streetes, the Matina – Ma-a Campus and the Technical School Campus in Sta. Ana Avenue. The bigger Matina – Ma-a campus is turned into a learning center worthy of its vision – with separate buildings for each of the colleges, in the concept of the premier state university. The BE Building houses the College of Accounting Education College of Engineering Education and the Library. DPT and GET Buildings, in which the former houses the College of Architecture and Fine Arts Education, College of Health and Sciences Education, College of Computing Education and College of Arts and Sciences while the latter, GET Building, is used by the College of Criminal Justice Education and College of Teacher Education. UM Continues to improve its facilities. To date, it has constructed and developed state of the arts facilities which include the air-conditioned libraries, audio-visual rooms, auditorium, speech laboratories, mini-hotel, engineering and science laboratories, different learning resource centers, computer laboratories centers, e-learning and computerized English language center. More programs are opened so that young men and women who opt to study in UM will have a wide variety of choices. The latest program offerings are Doctor in Public Administration, Ph.D. in Management, Ph.D in Criminal Justice, Ph.D in Linguistics, Ph.D in Education, Master in Library and Information Science, Master in Management, Master of Science in Economics, Bachelor of Science in Real Estate Management, Bachelor of Science in Accounting Technology, Bachelor of Fine Arts, Bachelor of Science in Biology, Bachelor of Science in Midwifery, Bachelor of Science in Legal Management and AB Multimedia Arts. The delivery of quality education is also a commitment. This is manifested by the number of CHED- Centers of Excellence and Centers of Development, the most by any private educational institution in Mindanao. It has consistently improved its ranking in the Philippine Association of Colleges and Universities- Commission on Accreditation being the 2nd most accredited school and the most number of Level III programs in the country. Further, true to its tagline of being the first has just recently passed the ISO 9001:2015 certification. It remains to be the only academic institution that has embarked into ISO certification that covers the entire organization. Its campuses outside Davao City have also embarked on both accreditation and ISO certification. The University is also committed to develop its human resource through the Human Resource and Development Center. It has laid a blueprint for the continuing education of its employees. The demand for the upgrading of the knowledge and skills of its faculty as well as its non-teaching staff has been met by providing full scholarship in pursuing higher studies, and the conduct of in-house and outside trainings, seminars and workshops designed to improve the delivery of quality instruction. Both teaching and non-teaching staff are also immersed in community extension activities. There is no doubt that today, the University of Mindanao has more than fulfilled the ideals for which the University was founded. It will continue to do so in all the years to come with God’s grace, and through the unwavering loyalty and dedication to duty, perseverance and hard work of all the men and women who have contributed to the growth and development of the University during its first 70 years and those who came and will come after them in the coming years.